The story of why and how more than 3 million high school students take the SAT or ACT, the college entrance exams required by most four-year colleges, is vividly dissected in THE TEST & THE ART OF THINKING. For decades there have been questions about exactly what these tests measure, what role they play in the admissions process and how predictive they are of academic success. The anxiety-provoking exams, and the multibillion-dollar test-prep industry that has grown up around them, have also become lightning rods in the ongoing national debate over equity in educational opportunity. No matter what age the child, they will have, or have had, a lot of pressure to perform well on these tests. There is also much money to be made from students and their parents in education particularly when it comes to the SAT/ACT with the not-for-profit College Board and the thousands of independent tutors reaping millions of dollars in profits. 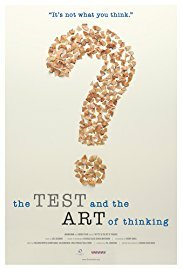 THE TEST & THE ART OF THINKING traces the history and evolution of the SAT/ACT as a major player on the pathway to higher education in America, and documents its current power in our culture. Director Michael Arlen Davis examines this controversy through interviews with students, parents, counselors, test-prep professionals and academics, to provide a fascinating look at this uniquely American rite of passage and how it reflects deeper issues in our educational system — and our society as a whole. Davis joins us for a lively conversation on how we got here and other options that may provide viable alternatives. The Test opens in Los Angeles on May 4 at Laemmle Music Hall in Beverly Hills.